We all have tons of tips to nip breakouts in the bud. We’ll fight those zits physically if we have to. But the easiest battle of all is one of prevention. 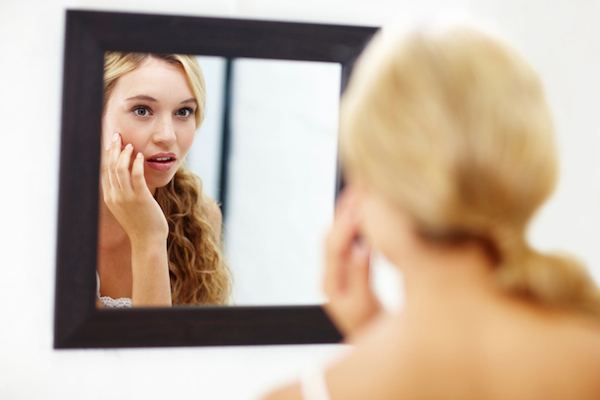 Follow these guidelines, and you may never have pimples to deal with again! Be careful with what products you use in your hair. Gina Kamburowski, a certified aromatherapist and founder of Théo Pure Skin Collection, recommends avoiding fragrances or heavy oils or gels if you’re wearing your hair down during the day or overnight. These products can block your pores and can also irritate skin, causing breakouts. So if you need to use these products, wash your hair often enough to keep your hair clean, but not so much that you dry out your hair. As always, find a good balance so both your hair and skin are happy! Clean your phone with rubbing alcohol at least once a week to prevent bacteria and dirt from transferring onto your face, says Katherine Dorn, a makeup artist at Pierre Michel Salon. Every time you put your hands into your cream blush, your liquid foundation, etc., you’re introducing germs, bacteria and oil into your products, says Jennifer Trotter, pro makeup artist based in Fort Worth, TX, of Lip Service Makeup. Copy the pro’s – use a metal palette and spatula and scoop out a tiny bit of product and use it from the palette instead. This will keep your makeup products clean and germ free, but will also help them last longer…bonus! Train yourself to not touch your face except for when applying makeup, says Trotter. Anytime you touch your skin, you’re leaving dirt and bacteria on it, as well as oils from your skin. If you have one zit, picking your skin can easily spread the germs and turn one into 10, so treat with acne medicine and leave it alone. Clean your makeup brushes and any other tools you use on your face. Brushes can carry dead skin cells, oil, bacteria and other residue you don’t want to reapply to your fresh face, says Kamburowski. It’s also important to clean the inside of your makeup bag to avoid cross contaminating other products or tools. Drink your water (and then some). Kamburowski recommends drinking freshly squeezed lemon water as soon as you wake up. This alkalinizing mixture is crucial for an anti-inflammatory diet and flushes out your system by cleansing your kidney and liver, which in turn aids in keeping your skin clear. Exercising is great for your skin, but make sure to wash your skin right after so that the sweat does not clog your pores and cause acne, says Dr. David Bank, a dermatologist and author of Beautiful Skin: Every Woman’s Guide to Looking Her Best at Any Age. Also, clean your yoga mat regularly and use a clean towel on the mat as a “barrier” between your face and the mat. Pressing your skin into a dirty mat can lead to clogged pores and therefore breakouts. Bike helmets can also cause acne. If dirty, the straps can cause friction and pressure that leads to clogged pores so make sure to wipe them down with an antibacterial wipe before using each time. You should wash your sheets and pillowcases once a week to help prevent breakouts. Oils from your skin are transferred onto the sheets and pillowcases, and sleeping on them every night contaminates your skin and pores with bacteria, Bank says. When you travel by plane, your skin becomes extremely dehydrated during the flight. Dehydrated skin can lead to dermatitis, so drink a lot of water and use extra moisturizer when flying, Bank says.